Leicester City Woodgate Inclusive Team players, John Astle and Kerry Lichfield came up with the idea of raising money to support the Children In Need Charity and indeed the Leicestershire and Rutland Inclusive League endorsed their support to the cause. 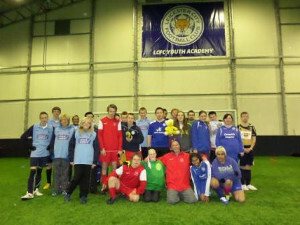 Players attending the Inclusive Football League event at the Leicester City F.C. Indoor Training Dome on the 23rd November, were asked to ‘donate to play’, there was also a few football items on sale too. The fundraiser for the BBC Children In Need Appeal raised a fantastic £250.12 for this very worthy Charity Appeal. The Leicestershire and Rutland Inclusive Football League provides an opportunity for a network of Inclusive (Disability) Football Clubs, across the City and County, to come together to play matches, where an ethos of Fun, Fair-Play and Respect is paramount, in order to ensure as much as possible that all players attending have a positive experience whilst playing football. The event at the LCFC Dome, saw teams competing representing, AFC BArwell, Aylestone Park F.C., Asfordby Amateurs Inclusive, Allexton and New Parks, Birstall Utd, Harborough Alliance F.C., Ibstock Utd F.C., Leicester City Woodgate F.C. and Oadby & Wigston Inclusive. Over 140 players, males and females, took part in the event over 4 divisions, Junior, Youth, Adults Red and Adults Blue. A massive ‘Thank-you’ must also go out to our very own committed and dedicated Club volunteers, Paul Gibson, Harry Gethins, Graham Prosser and Manjit Takhar who ensured our 7 small sided teams taking part on the day had a positive experience whilst playing football. Other Inclusive Clubs and their volunteers helped to ensure the days was a success, managing teams, refereeing matches and helping to ensure players enjoy a great day of football. The League and Inclusive Club members are always willing to support each other and their time, commitment and hard work is truly invaluable. The League has the support of the Leicestershire and Rutland Inclusive Football Partnership (Charity) who is committed to continuing the development of Inclusive (Disability) Football and working with local F.A. Charter Standard Clubs to support them in starting up Inclusive Teams. This entry was posted in Inclusive County League News. Bookmark the permalink.